Here are some of the best posts of 2007, in various categories. Enjoy, and see you in 2008. These two articles on NCYC, because they were picked up by Fr. Z, got us about 12,000 hits in one week and a bunch of attention for this blogpostolate. I finished reading today part two of the late Michael Davies's "Liturgical Revolution" series, Pope John's Council. This is now unfortunately out of print, although volume one, Cranmer's Godly Order, has been recently republished by Roman Catholic Books. Perhaps if enough orders are placed for this one, they will also republish volumes two and three (Pope Paul's New Mass). The edition of Pope John's Council upon which I stumbled in a library is the fifth printing dating from 1987, original copyright 1977; published by Angelus Press. This book forces the reader to take a hard look (and it's not a pleasant sight) at the facts. Already in 1968 Pope Paul VI laments that the Church is engaged in self destruction (autodistruzione). On 29 June, 1972, he famously states that the smoke of Satan has entered the Church (how can one not be reminded here of Pope John XXIII's equally famous words about throwing open of the windows of the Church?). To deny that the Catholic Church after Vatican II entered immediately into a state of crisis rivaled only by the periods of the Arian and Protestant heresies is sheer blindness (whether deliberate and malicious or not, I leave to God to judge). The Church before the Council, by contrast, was vibrant with vitality. Missionary activity was flourishing, as was apostolic activity on the part of the laity. Pope John XXIII himself, in his apostolic constitution Humanae salutis convoking the Council acknowledged the vitality of the Church as it then was: "...It has opposed decisively the materialistic ideologies which deny faith. Lastly, it has witnessed the rise and growth of the immense energies of the apostolate of prayer, of action in all fields. It has seen the emergence of a clergy constantly better equipped learning and virtue for its mission; and of a laity which has become ever more conscious of its responsibilities within the bosom of the Church, and, in a special way, of its duty of to collaborate with the Church hierarchy" (paragraph 5). What, then, of the problems in the pre-Vatican II Church that are constantly cited as justification for the Council? Surely no one will repeat the tired old canards about how old women sat in the pews mumbling their rosaries and telling their beads during the Mass, and about how the priest used to offer Mass with his face to "the wall" instead of to "the people"! Is anyone seriously going to maintain that these pious old women, whoever they were, really should not have been meditating upon the mysteries of Christ's life and death as if this was inconsistent with the nature of the Mass? Will they seriously maintain that the "folks in the pew" now understand the mystery of the holy sacrifice better or enter into it more fully? The deceit inscribed at the heart of the old argument for Mass "facing the people" instead of "facing the wall" must be seen for the insult against the divine Masjesty that it truly is. The simple fact is that the priest faced God, not the wall; he faced God substantially present in the tabernacle and symbolically present in the east (where the Son of Justice rises to enlighten the earth). The turning of the priest toward the people, which should be called the turning of the priest away from God, has contributed immeasurably towards the anthropocentrism now prevelant in all but the rarest celebrations of the New Order of Mass. If there was anything that really needed to be reformed in the Church prior to the Council it was precisely the exagerrated sense of obedience, uncritical acceptence of everything emanating from one's ecclesiastic superiors, which was not reformed, but exploited! Well, this is long enough for one post, but I've only highlighted the first two chapters out of seventeen. Look for further installments soon; this is an important series of books, and this one in particular is mandatory reading for any traditional Catholic who wants to know what really happened at Vatican II to open the windows to the smoke of Satan. The Coalition in Support of Ecclesia Dei has given a response to several inquiries by persons wanting to know about the status of the TLM around the country since Summorum Pontificum. The status is good: the TLM is spreading for sure. Before July 7, 2007, the Coalition shipped 1,000 Latin-English Missals each month. Since July 7 we have shipped 1,000 booklets every week. In May, we had reprinted 20,000 booklet missals, and ordered another 20,000 in October. Latin-Spanish books have been reprinted, as have the books for Requiem Mass. The Nuptial booklets are next, their report said. By the way, in case anybody is buying in to the notion that you have to be an arch-conservative academic egghead with a mastery of Latin in order to get anything out of the old Mass, the Coalition also reports a call from a father who ordered booklet missals for his family because his 12-year old son prefers the Old Latin Mass to the new English Mass. This is so simple, even kids get it! What was that Jesus said about "out of the mouths of babes and suckings..."? The Coalition also reports that orders for the Know Your Mass book for the training of altar boys are also up, and that 800 training DVD's ("The Most Beautiful Thing This Side of Heaven") have been ordered by priests wanting to learn the TLM. These are most encouraging facts! If anybody else out there has any stories about the spread of the TLM, please keep us updated! Tomorrow, December 29th, is this blog's 6 month anniversary. Since that time, we have had 267 posts (counting this one) on a variety of topics ranging from politics to history and definitely a lot on liturgy (By the way, to see our very first post, click here). 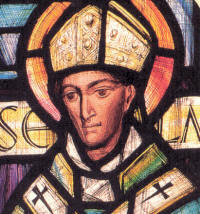 Anselm and I both sincerely pray that you are blessed and edified by what you find here on Unam Sanctam Catholicam. After New Year's, I'll put up some of the best posts of 2007 for you all to check out. In the meantime, if you want to give Anselm and I a good Christmas present, how about letting somebody else know about this blog or forwarding a link to one of your favorite articles to somebody who has not yet visited here. We like to think that the work we do at this blog is at least somewhat important to the life of the Church, and the more people we can get connected the better we can work and pray to restore the Traditions of the Church. Therefore, please take a moment and let a friend know about this humble little corner of Cyberspace. 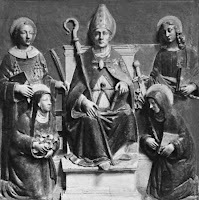 Here's a nice pic of Anselm. When I first met him, his flesh colored eyes were difficult to get used to, but I finally accepted him for who he is. Here's a picture of me from a recent Vatican stamp. I really take issue with this representation though, because I don't think my jowls are that big. Hope you are all having a Merry Christmastide! By the way, speaking of Christmas, click here for the words to my favorite Christmas carol. I think the words, the typology, allegory and the connection with old Anglo-Saxon England that they hearken back to are all beautiful. However, the arrangement on the above link is not my particular favorite. Unfortunately, the arrangement of it that I like is very, very rare. I did find it, though, sung by the Norwich Cathedral Choir. You can listen to it here. Check this out, from the blog Whispers in the Loggia. It is the King's College Choir singing "Once in Royal David's City." Very beautiful, indeed. Pay attention on here when the little timer at the bottom gets to 3:40, you will see it focus in on this kid who keeps looking into the camera and away from his music sheets. At 3:49 exactly, an anonymous hand reaches out from behind him, grabs him by the shoulder and kind of turns his head back to his music. It's quite amusing. One thing about English: for as much as I love Latin, I don't want anyone to think that I despise English music. On the contrary, some of the most beautiful hymns that have ever been penned have been written in the English tongue, especially around Christmas time. But, whereas with Latin we have lost the usage of the language in its entirety, in English we have a stranger phenomenon. While English is obviously used liturgically, since it is the vernacular and that's what everybody uses now, we have experienced a great dumming down of the way in which English is used, both in the prayers we pray liturgically and in the hymns that are sung. I've said it before, that if we are bound and determined to use vernacular in our worship, let's at least use good vernacular. Come, Thou Fount of every blessing,Tune my heart to sing Thy grace; Streams of mercy, never ceasing,Call for songs of loudest praise.Teach me some melodious sonnet, Sung by flaming tongues above. Praise the mount! I’m fixed upon it, Mount of Thy redeeming love. Sorrowing I shall be in spirit, Till released from flesh and sin, Yet from what I do inherit, Here Thy praises I’ll begin; Here I raise my Ebenezer [meaning a sign of victory, a reference to 1 Sam. 7:12]; Here by Thy great help I’ve come; And I hope, by Thy good pleasure, Safely to arrive at home. Jesus sought me when a stranger,Wandering from the fold of God; He, to rescue me from danger, Interposed His precious blood; How His kindness yet pursues me, Mortal tongue can never tell, Clothed in flesh, till death shall loose meI cannot proclaim it well. O to grace how great a debtor, Daily I’m constrained to be! Let Thy goodness, like a fetter, Bind my wandering heart to Thee. Prone to wander, Lord, I feel it, Prone to leave the God I love; Here’s my heart, O take and seal it, Seal it for Thy courts above. O that day when freed from sinning, I shall see Thy lovely face; Clothed then in blood washed linen How I’ll sing Thy sovereign grace; Come, my Lord, no longer tarry,Take my ransomed soul away; Send thine angels now to carry Me to realms of endless day. Now, look at some of these beautiful lines: "Teach me some melodious sonnet, Sung by flaming tongues above. Praise the mount! I’m fixed upon it, Mount of Thy redeeming love" (v.1). What song-writer for GIA would use the phrase "melodious sonnet" in their composition? That would seem to high-falutin' for their liking. In verse 3 it says, "Jesus sought me when a stranger,Wandering from the fold of God; He, to rescue me from danger, Interposed His precious blood." What a beautiful image! When was the last time you heard somebody use the word "interposed"? Verse 4 has my favorite line, where is says, "O to grace how great a debtor, Daily I’m constrained to be! Let Thy goodness, like a fetter, Bind my wandering heart to Thee." How wonderful to conceive of God's love as a fetter that binds the heart to the Divine Goodness! Our soul hath been delivered as a sparrow out of the snare of the fowler. The snare is broken, and we are delivered. Our help is in the name of the Lord, Who made heaven and earth. Lord, we are citizens of this earth and ask to be made citizens of heaven by your free gift. Help us to run in the way of your commandments and to set our hearts on you alone. Maybe it is just me; maybe I am being a bit too picky, but do you see a difference in the way things are worded, in what is emphasized in each example? And what's the idea calling us "citizens of this earth"? Sounds like European Union propaganda to me. Last I checked, Hebrews 13:14 said, "Here we have no lasting city, but we seek the city which is to come." Flowers of martyrdom, all hail! Smitten by the tyrant foe on life's threshold, as the gale strews the roses ere they blow. First to bleed for Christ, sweet lambs! What a simple death ye died! Sporting with your wreaths and palms at the very altar side. Honor, glory, virtue, merit be to Thee, O Virgin's Son! With the Father, and the Spirit while eternal ages run. Amen. Father, Lord of earth and heaven, King to whom all gifts belong, give Your greatest Gift, your Spirit, God the holy, God the strong. Stay among us, God the Father, stay among us, God the Son, stay among us, Holy Spirit: dwell within us, make us one. Whatever the intention is, can you perceive the loss of vibrancy and expressiveness in the English language in these two examples? It is all intentional (though I'm sure much has to do with simple lack of talent). Let's make sure that while we are defending Latin from the front door, we don't let them sneak in and ruin English from the back door. There are liturgists and theologians out there who would have us all praying and talking like this if they could: "We Church. God good. Tolerance double-plus good. Intolerance double-plus ungood." Linsguistic sophistication is the tangible measure of which we are able to express ideas verbally, and thus what we are able to say about our ideas. It must be preserved at all costs. 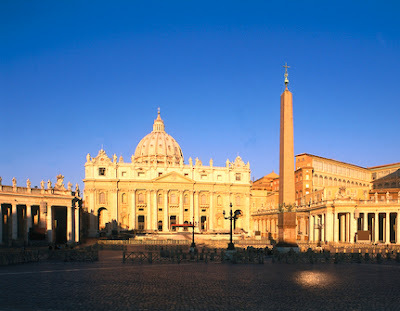 In part one of this post last week, we looked at the common fallacy that sees the establishment of the headship of the Church at the city of Rome as a mere accident of history that was due primarily to political factors. This position is in fact condemned by Pope St. Pius X in Lamentabili Sane, number 56, where the following statement, The Roman Church became the head of all the churches, not through the ordinance of Divine Providence, but merely through political conditions, is anathematized. Last time we looked at some false, modernist notions of how the Church of Rome came to preeminence. We also looked at the historical argument for Rome's primacy (it's double-Apostolic origin). Today we shall look at the Scriptural or theological reasons for the headship of the Church of Rome over all of the other churches. The Bishop of Constantinople to have the primacy of honour next after the Bishop of Rome, because Constantinople is New Rome (canon 3). Now, this canon says nothing about why Rome has the primacy, but it states quite emphatically that Constantinople comes after Rome because of its position as "New Rome," i.e., because of its political importance as the imperial capitol. The Greeks had always attached great importance to the unity of the ecclesiastical and imperial authority, but such a political explanation, though sufficing to obtain second rank for Constantinople, is insufficient as a theological explanation for Rome's preeminence. The head of this image was of fine gold, its breast and arms of silver, its belly and thighs of bronze, its legs of iron, its feet partly of iron and partly of clay. As you looked, a stone was cut out by no human hand, and it struck the image on its feet of iron and clay, and broke them in pieces; then the iron, the clay, the bronze, the silver, and the gold all together were broken in pieces, and became like the chaff of the summer threshing floors; and the wind carried them away, so that not a trace of them could be found. But the stone that struck the image became a great mountain and filled the whole earth (Dan. 2:32-35). The God of heaven will set up a kingdom which shall never be destroyed, nor shall its sovereignity be left to another people. It shall break in pieces all these kingdoms and bring them to an end, and it shall stand forever; just as you saw that a stone was cut from a mountain by no human hand...The dream is certain, and its interpretation sure (v. 2:44-45). So the stone represents a new kingdom that replaces the old ones, though this new kingdom is built and established by God and will last forever. And where does it strike? Where does this kingdom touch the earth to begin its expansion? At the feet of iron, or, in the place of Rome. The kingdom of God at the same time demolishes and replaces the power of Rome. Babylon: At first the Babylonians persecute the Jewish refugees for refusing to worship the gods of Babylon; but after and miracles wrought by Daniel and the deliverance of Shadrach, Meschach and Abednego, Nebuchadnezzar makes the following decree: Truly, your God is God of gods and Lord of kings...Therefore I make a decree: Any people, nation or language that speaks anything against the God of Shadrach, Meschach, and Abednego shall be torn limb from limb, and their houses laid in ruins; for there is no other god who is able to deliver in this way (2:47, 3:29). At first, he persecuted Israel, now he supports them by punishing anybody who would deny their God. Persia: Both by the cunning of Haman and the plot hatched against Daniel by the councilors of Darius do the Persians attempt to destroy God's people. But following Daniel's deliverance, Darius decrees: I make a decree, that in all my royal dominion men tremble and fear before the God of Daniel, for He is the living God, enduring forever (6:26). After the exposing of Haman's treachery by Esther, King Xerxes/Ahasuerus issues the following decree: We find that the Jews...are sons of the Most High, the most mighty living God, who has directed the kingdom both for us and for our fathers in the most excellent order. And to those who dare to molest God's people: Every city and country, without exception, which does not act accordingly, shall be destroyed in wrath with spear and fire (Est. 16:15-16, 24). Furthermore, it is the Persian King Cyrus who issues the command to rebuild the Temple (2 Chr. 36:22-23, Ezr. 1:2-4). So ardently did this Cyrus promote the interests of the Jews that God calls this pagan His "anointed" (Isa. 45:1). In all these examples, we can see that though the Persians began by persecuting God's people, in the end they promoted them greatly, even to the point of rebuilding the Temple with funds from the royal treasury. 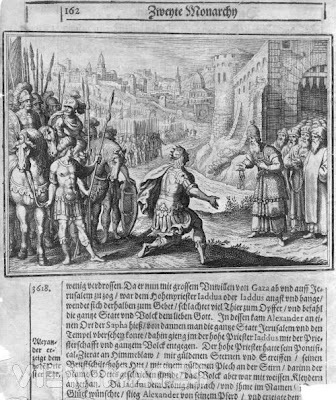 When [Alexander the Great] had obtained Sidon, he besieged Tyre, when he sent a letter to the Jewish high priest, to send him some auxiliaries, and to supply his army with provisions...but the high priest answered the messengers, that he had given his oath to Darius [King of Persia] not to bear arms against him and he said that he would not transgress this while Darius was in the land of the living. Upon hearing this answer, Alexander was very angry; and though he determined not to leave Tyre, which was just ready to be taken, yet as soon as he had taken it, he threatened that he would make an expedition against the Jewish high priest, and through him, teach all men to whom they must keep their oaths. Now Alexander...made haste to go to Jerusalem; and Jaddua the high priest, when he heard that, was in agony, and under terror, as not knowing how he should meet the Macedonians, since the king was displeased at his foregoing disobedience. And when [Jaddua] understood that [Alexander] was not far from the city, he went out in procession with the priests and the multitude of the citizens. The procession was venerable, and the manner of it different from that of other nations...[but] Alexander, when he saw the multitude at a distance, in white garments, while the priests stood clothed with fine linen, and high priest in purple and scarlet clothing, with his mitre on his head having the golden plate on which the name of God was engraved, he approached by himself and adored that name, and first saluted the high priest. The Jews also did altogether with one voice salute Alexander, and encompass him about: whereupon the kings of Syria and the rest were surprised at what Alexander had done, and supposed him disordered in his mind. However, Parmenio alone went up to him and asked it how it came to pass that when all other adored him, he should adore the high priest of the Jews? To whom he replied, "I did not adore him, but that God who hath honored him with that high priesthood; for I saw this very person in a dream, in this very habit, when I was at Dios in Macedonia...whence it is, that having seen no other in that habit, and now seeing this person in it, I believe that I bring this army under divine conduct...and that all things will succeed according to what is in my own mind...and when he went up into the temple, he offered sacrifice to God, according to the high priest's direction. I know it is a long quote, but this wonderful story verifies what I have been saying. Here, Alexander wants to destroy Jerusalem and punish the high priest, but through God's intervention, he ends up acknowledging the true God and supporting His people by his royal decrees. 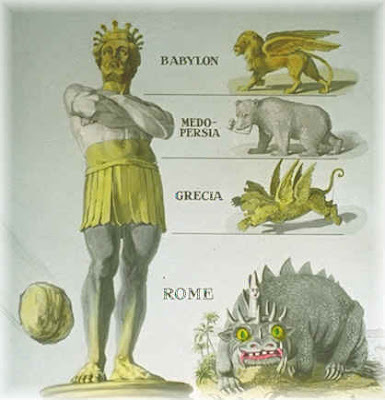 We have seen this scenario played out with three of the four kingdoms witnessed by Daniel. But it is to the fourth, which was "different" from the other three kingdoms, that God promised to smash with a rock and replace with a mountain that would fill the whole earth. It is our desire that all the various nations which are subject to our Clemency and Moderation, should continue in the profession of that religion which was once delivered to the Romans by the divine Apostle Peter, as it hath been preserved by faithful tradition...but as for others, since, in our judgment, they are foolish madmen, we decree that they shall be branded with the ignominious name of heretics, and shall not presume to give to their conventicles the name of churches. They will suffer in the first place the chastisement of the divine condemnation, and in the second the punishment which our authority, in accordance with the will of heaven, shall decide to inflict (Decree of Theodosius I, 380). This is a repeat of what happened to Nebuchadnezzar, Darius, Ahasuerus, Cyrus and Alexander, only now it was different, because now the converted kingdom was promulgating not just the shadows of the Old Testament but the glorious light of the New, which will never pass away. Babylon, Persia, Greece and Old Rome passed away, but the Church of Rome, founded by God on the Apostle Peter, has become that stone that became a great mountain that filled the whole earth which was spoken of by Isaiah the prophet: "In the latter days the mountain of the Lord's house shall be established on the top of the mountains, and all nations shall flow to it. Many peoples shall come and say: "Come, let us climb the LORD'S mountain, to the house of the God of Jacob, That he may instruct us in his ways, and we may walk in his paths. 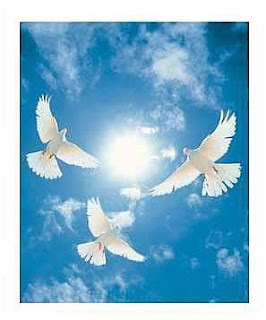 For out of Zion shall go forth the word of the Lord" (Isaiah 2:1-3). It is this kingdom which shall never pass away. In case you are wondering, I did not make this explanantion up. In my research on kingship in the Middle Ages, I found this view of the Roman Church as the inheritor of the fourth kingdom in the writings of many of the medieval political theorists and theologians, although many saw this kingdom to be not the Roman Church, but the Holy Roman Empire. But by it we can see that it was not by any accident that the head of the Church wound up in Rome. It was part of a long and divinely ordained pattern that went back to Nebuchadnezzar and Daniel. It was all part of God's great plan for making use of the nations of the earth to spread His message and proclaim His glory. Well, sorry about all the missed days, but I think the craziness brought on by the baby and getting ready for the holidays is over now and I should be back to posting on my regular schedule again. Thanks for your patience! In a homily I recently heard, the priest made some very interesting remarks about the modern celebration of Christmas. First, as many others have noted in the Catholic world, he pointed out that the secular, consumerist drive to push Christmas sales as forced the Christmas season further and further back into the year until it has swallowed up the liturgical season of Advent. Christmas stuff all is brought out almost as soon as Thanksgiving dinner is off the table, oftentimes even sooner, like the day after Halloween. Many Catholics in the blogging world have noted this, and so I will not comment on it here, save to say that it is very sad because it robs us of our attention on the preperatory nature of Advent. If we prepare for the Second Coming the way we "prepare" for Christmas, then we are all lost. But what I want to dwell on here was the priest's observation that in modernity Christmas has a forlorn, sad and melancholy atmopshere about it that is exemplified in some of the best known secular Christmas songs of our times. By secular Christmas songs, I mean stuff like "White Christmas," "Chestnuts Roasting on an Open Fire," "Home for the Holidays" and such tunes, as opposed to religious Christmas music like "Joy to the World" and "Hark! The Herald Angels Sing." Most of our religious Christmas music comes from the 18th and 19th centuries and was written by churchmen of one branch or another, while our secular religious music comes from a few decades: the 1940's through the early-1960's. White Christmas (Irving Berlin, 1940): I'm dreaming of a white Christmas, just like the ones I used to know. Where the treetops glisten, and children listen to hear sleigh bells in the snow. Have Yourself a Merry Little Christmas (Blane & Martine, 1943): Here we are as in olden days, Happy golden days of yore. Faithful friends who are dear to us gather near to us once more. In both of these selections, there is a nostalgic longing for something past, a Christmas "like the ones I used to know," a desire for the "olden days, happy golden days of yore." But, we could ask, why were the olden days the golden days, and what is deficient about Christmas now (or, rather, in the 1940's when these songs were written) that makes us turn our hearts towards and earlier epoch? Many people have noted that Christmas music tends to depress them. I have no evidence to back this up, but I do not think it is due to songs like "Silent Night" and "Come All Ye Faithful." The religious, Christian-based Christmas songs are always joyful and triumphant, as the English "Adeste Fideles" says. No, I think that when people say they are depressed by Christmas music, they mean the secular Christmas songs, the stuff we are talking about here from the 40's and 50's. It is well documented that Christmas is the saddest time of year for many people, and suicides are frequent during the Yuletide, as well. I'm sure much of this has to do with the fact that when people are alone at Christmas, they feel it more intensely than at other times of the year, but I think some of this secular Christmas music exacerbates the problem. I opine that the reason for the melancholy is this: this secular Christmas music exposes how bankrupt our culture is, both because of its spiritual shallowness and because of our web of technological comforts that keep us from experiencing the fullness of our humanity through immediate contact with creation. We extol many things in these songs which are no more than phantoms to most people, ghosts of a bygone era. Think about it for a moment. When was the last time you smelled or ate chestnuts roasting on a open fire? 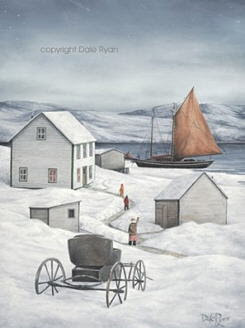 Or experienced the joy of rushing over frozen fields in a single-horse drawn sleigh to the jingle of the harness bells? Or put up any real holly or ivy? Or kissed under some mistletoe? Or stood around the Tannenbaum and sung reverently? Or even had a real Christmas tree for that matter? Or saw, let alone heard, a real silver bell? Or went "home" for the holidays? You know, in the song, "Home for the Holidays," the word "home" does not just refer to where you or your parents happen to live as we tend to use the word today. It refers to an antiquated concept of home, to an ancestral farmstead in the country where we retire from the busy suburban life and return to our roots, to the place where our families first settled in this land and carved out a living out of the wilderness. When this song was written in 1954 by Rob Allen and Al Stillman, this concept of a rural, familial homestead was still a reality for many people, and some elderly persons still living were the same who had first settled the frontier in the 1880's and 90's. That generation, and that way of life, is long gone. Who goes back to an ancestral farmstead anymore? My family's ancestral farm that we had possessed since the 1870's in Virginia was recently torn down to make room for another crappy Pulte sub. Yes, the way of life we idolize in these songs has vanished forever. At any rate, we can beat the melancholy aspect of secular Christmas by refocusing ourselves on what we know to be the spiritual core of the holy day: Christ's Incarnation. It is right for us to deplore what has happened to our culture in the past hundred years or more, but we do not despair as those in the world who have no hope (1 Thess. 2:13), but rather our hope is in Christ and His redeeming work, Who on the last day will raise us up and restore unto us infinitely more than we ever lost by our sin. This is the great joy of Christmas. 56. The Roman Church became the head of all the churches, not through the ordinance of Divine Providence, but merely through political conditions. What does this mean, that the Roman Church became the head of all churches from "ordinance of Divine Providence" and not through political conditions? Well, I think it is sufficiently obvious that to be founded through the ordinance of Divine Providence means that the headship of the Roman Church was directly and positively willed by God; i.e., that it was His perfect will, not simply His permissive will. Rome's headship over the churches was part of God's eternal plan, just as much as Jesus' Incarnation or the coming of the Spirit at Pentecost. Yet, how often when we read historical accounts of the ascendancy of the Roman Church do we hear only arguments from political developments that lack any reference to its divine founding? For example, how many times have you heard some kind of explanation that says that as the civil power failed in the Western Roman Empire due to the barbarian invasions (and as the imperial court moved east), more and more civil responsibilities fell to the Papacy, thus making the institution far more important and powerful than it had been in the earlier centuries. Or maybe something about Rome being the "natural" place for the Church to be centered since it was the political capital of the Empire? Now, these arguments may be true in explaining the secondary causes for why Rome happened to become the head of the churches, but they are deficient because they fail to mention the primary cause: because God willed it to be so. Without reference to God as the primary agent in the establishment of the Popes at Rome, we are left with only historical/political arguments, arguments which Pius X says are defective. The Fathers of the Church, in so far as they mention the founding of the Church at Rome, usually make recourse to its double-apostolic origin, the fact that it had both Sts Peter and Paul as its founders. For example, Tertullian makes this statement around the year 200: "But if you are near Italy, you have Rome, where authority is at hand for us too. What a happy church that is, on which the apostles poured out their whole doctrine with their blood; where Peter had a passion like that of the Lord, where Paul was crowned with the death of John [the Baptist, by being beheaded]" (Demurrer Against the Heretics 36 [A.D. 200]). This statement is standard among the Fathers: Rome's authority is guaranteed by her double-apostolic origin of the two most illustrious apostles. This is a notably better argument than the historical ones cited above, and the Fathers usually use it with reference to this establishment being of God's will. But again, if we rely solely on this one and cut out any reference to the Divine mandate of the Father (as often happens), then this too falls short. Why? Because this argument is very closely linked with the fact of Peter's residency in Rome, and there is no necessary theological reason why Peter should have wound up in Rome. A man I know once met the Patriarch of Antioch. The Patriarch told him that he would be pope right now if Peter had stayed in Antioch instead of going to Rome. So in a sense, he viewed Peter's settlement in Rome as a kind of accident of history, in that if Peter had decided to stay in Antioch, the bishops of Antioch would be popes; or if Peter went to England, then the Archbishops of Canterbury would wield Petrine authority. But the residency of the popes at Rome is no such historical accident, neither of political conditions in the late Roman Empire nor of the of the individual missionary journeys of the Apostles. We know for a fact that the primacy was attached to Peter as a person and passed on to those who inherited his office. The office remained at Rome, but was there any theological reason why Rome should have been the seat of the Church, or can we only come up with accidental, historical reasons to account for it? Pope St. Pius X says we must believe that it was of Divine Providence, and not due to an accident of history. Therefore, there must be a theological reason. Can we know what this reason is? There are good theological and scriptural reasons for the physical locating of the Church in Rome, which I will go into next time. 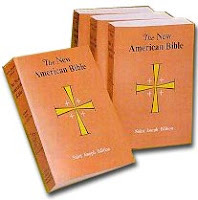 As a follow up to Boniface's Ten signs you have a bad Bible commentary, I would like to draw your attention to the St. Joseph Edition of the New American Bible. I'm sure you've seen this one before. The parish at which I worked for a time had hundreds of them in the parish center. New Addition to "My Writings"
The theology of Joseph Ratzinger has received wide and well deserved attention; ever more so since his election to the chair of St. Peter in April 2005. The purpose of this paper is to draw out some of Ratzinger's key insights into the meaning of Christ’s suffering as an intrinsic part of the work of redemption; what does it mean that "we are healed" by "his stripes" (Is 53:5)?1 After an introductory note on Ratzinger’s soteriological method, we will turn directly to the mystery of Christ's vicarious atonement. We will consider first the vicariousness of Christ's suffering – that mysterious change of place prophesied by Isaiah: "he was wounded for our transgressions, he was bruised for our iniquities" (Is 53:5 [my emphases]). Two of the fundamental questions in this connection must be: how is it possible for Christ to take upon himself the sins of others? And, in what relation does he stand to the sin that he bears? In the second part of this paper we will then consider the reconciliation between God and mankind effected by Christ’s suffering, looking first at Christ's interior pain of sorrow in light of Ratzinger's words on the nature of forgiveness, and then also at the complete pain of Christ's passion as the expression of a love so pleasing to God that it satisfies God's justice, pacifies his wrath, discharges man's debt of punishment, and merits glory for Christ and salvation for mankind. Please feel free to read the rest of the paper and post your comments on it here. Enjoy! In the past few weeks I have been reading several Bible commentaries (well, not really reading them, but browsing theough them) to see what is going on in the world of Catholic biblical scholarship these days. The two I examined most recently were Inside the Bible by Fr. Kenneth Baker, SJ (Ignatius Press, 1998) and another one called A Catholic Guide to the Bible by Fr. Oscar Lukefahr, a Lazarist (Ligouri, 1998). Needless to say, the Ignatius Press one was a little bit more orthodox than the one by Ligouri, but both commentaries suffered from what I considered deplorable deficits in their scirptural scholarship. This led to wonder, what exactly is a good Bible commentary? The answer to that is multifold, and it may be easier to list several warning signs that you have a bad commentary (sadly, because these are so much more common). If you pick up a commentary and some of these positions are espoused, you might do well to get another one. So, let me present to you my Top Ten Signs You Have a Bad Bible Commentary. I have tried to list these in order from least to most aggregious errors, and some (though not all) of these were found in both of the commentaries listed above. I'm interested on your feedback as to whether these are as serious as I claim them to be, and whether or not there may have been others that I have missed. One more note: these signs have to do with Bible scholarship specifically (i.e., exegetical and hermeneutical practices in the interpretation of the Scriptures), not with ways that we approach Revelation in general. Thus, you will not find on this list the notion that the Bible is only inspired in areas pertaining to salvation, though this is certainly a huge and common error. Rather, this list treats of more specific errors that pertain to certain biblical books. Now, on with the list. 10) The Dating for the Book of Daniel: Daniel, for 2,000 years of Jewish and Christian history, has been dated as being written during the time of the Babylonian exile. Modernist scholarship, however, attempts to date it after the reign of Antiochus Epiphanes (c. 163 BC). Why? As Fr. Baker says in his commentary, there are too many prophecies in Daniel that have way too much accurate information about the time of Antiochus. The implication is that real prophecy can't happen, and if any prophecy looks too accurate, it must have been written after the fact. 9) The "Reed Sea": When you get to the commentary on the Exodus, does it say that the Israelites didn't really cross the Red Sea, but a very shallow ( 3 inches) marsh called the Reed Sea? The motivation here is an arrogant disbelief in the miraculous crossing of the Red Sea, since the crossing of a marshland of three inches of water requires no miraculous explanation. Again, the modernist interjection is a denial of the miraculous intervention of God on behalf of His people. 8) There are Two Contradictory Genesis Accounts of Creation: Does the commentary attempt to force a dichotomy between the Creation account of Genesis 1 and Genesis 2? This is often suggested by appealing to the so-called "Documentary Hypothesis," a popular belief that several authors with different theologies all contributed to the Old Testament (they are often referred to as the Elohist, the Jahwist, the Priestly, and the Deuteronomic writers). The implication is that there is no clear and consistent theology in the Old Testament, but that it is a pluralistic compilation of several varying and often contradictory theologies. The Pontifical Biblical Commission during the time of Pius X condemned this belief). 7) Second Isaiah: The book of the prophet Isaiah was actually written by two men. Why, well, it is obvious that Isaiah lived in the 8th century BC, but he seems to make prophecies that relate to the restoration of Israel after the Exile (5th century). Therefore, he could not have written them. Again, like with #10, the implication is a disbelief in the reality of prophecy. 6) Jonah is a Parable: Read the commentary on Jonah; does it say the story is probably a parable only? This is another result of a disbelief in supernatural occurences and Divine Providence. The Jews, Church Fathers and Jesus Himself all referred to Jonah as a historical book. Who are we to say any differently? 5) Most Books are Dated as After the Exile: If you check the dates that the commentator says each book was written in, do most of them fall after the Exile, even the Pentateuch? By placing most books as being compiled after the Exile (c. 497 BC), the commentators are attempting to insert doubt into the Biblical texts by removing them further and further from the events described in them, by making them the work of scribes instead of inspired prophets and by casting doubt on Tradition as a whole, since Tradition says that the Pentateuch was written during the time of the Exodus (c. 1400 BC), not during the Exile. 4) Advocates the "Q" Theory in the NT: Does it deny the traditional assertion, going back to St. Irenaeus, that Matthew's Gospel was the first to be written and instead assert the existence of a primitive common "source" for all the Gospels, which it calls "Q"? This is a modernist theory and the corner of liberal biblical scholarship. It is an attempt to solve what is called (arrogantly), the "Synoptic Problem," which is the fact that all of the Gospels use similar language and agree with each other. Admitting that this is due to their historical veracity and divine inspiration is not even brought up. Instead, a purely historical reason is looked for. To the extent that this "Q" theory is advocated, the reliability of the NT is often questioned. 3) The Genesis Account is Taken From Babylonian Folklore: This assertion makes a joke of the unique Creation of the world by God, casts doubt on the historicity of Genesis, insults inspiration and mythologizes the Creation. For this reason, it is a most grievous error. 2) A Late Date for John's Gospel: John's Gospel contains some of the most profound and important sayings of Jesus, sayings on which much Catholic doctrine finds its source. Thus, it is in the interest of those who hate the Church to try to claim that this Gospel was not written by John (and therefore, that the words are not really those of Jesus), but was composed sometime between 120 and 200 AD by a "Johannine community" whose writings represent their specific theology and not the authentic words of Christ. This claims dares to put forth the notion that the words fo Christ as recorded in the Fourth Gospel are not His own but those of men put into the mouth of Christ. 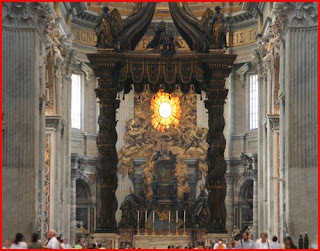 1) Matthew 16:18-20 is A Later Addition: Yes, the biblical foundation of the papacy in Matthew 16 is often claimed to be a later addition by partisans of St. Peter. Why? Because this verse gives such clear authority to Peter that it cannot have possibly come from Jesus! Therefore, it must be an addition. This position rejects out of hand the inspiration of the Scriptures, the power ans authority of the Church and Christ's willed institution of the hierarchy. No one can advocate this position in any way and still be a good Catholic. For this reason, I list it as number one on my list. Please feel free to add your own if I have omitted any. Please state the reasons why you believe it to be an error. Looks like evangelization and ecumenism are in the headlines a lot recently! Well, after reading Cardinal Dulles' dull suggestion (pun intentional) that we practice evangelization by asking Protestants and Orthodox to preach to us, and having heard from a Southern Baptist about what weak evangelizers Catholics are, I was very delighted to hear some sound advice from the good ole Congregation for the Doctrine of the Faith regarding evangelization and the Church's mission ad gentes. I will cite the entire document below (though you can find it at this link as well). By the way, the document seems to be a summary of the actual document, of which I have as of yet not been able to find a copy of online. 4. While some forms of agnosticism and relativism deny the human capacity for truth, in fact human freedom cannot be separated from its reference to truth. Human beings are given intellect and will by God that they might come to know and love what is true and good. The ultimate fulfillment of the vocation of the human person is found in accepting the revelation of God in Christ as proclaimed by the Church [Right. All people, by their nature, have a duty to seek truth]. 6. The communication of truths so that they might be accepted by others is also in harmony with the natural human desire to have others share in one’s own goods, which for Catholics includes the gift of faith in Jesus Christ. Members of the Church naturally desire to share with others the faith that has been freely given to them [or at least they ought to!]. 8. Any approach to dialogue such as coercion or improper enticement that fails to respect the dignity and religious freedom of the partners in that dialogue has no place in Christian evangelization. 9. "Since the day of Pentecost … the Gospel, in the power of the Holy Spirit, is proclaimed to all people so that they might believe and become disciples of Christ and members of his Church." "Conversion" is a "change in thinking and of acting," expressing our new life in Christ; it is an ongoing dimension of Christian life. 12. The CDF document points out the important role of ecumenism in the Church’s mission of evangelization. Christian divisions can seriously compromise the credibility of the Church’s evangelizing mission [that's an understatement!]. The more ecumenism brings about greater unity among Christians, the more effective evangelization will be. 13. When Catholic evangelization takes place in a country where other Christians live, Catholics must take care to carry out their mission with "both true respect for the tradition and spiritual riches of such countries as well as a sincere spirit of cooperation." Evangelization proceeds by dialogue, not proselytism. With non-Catholic Christians, Catholics must enter into a respectful dialogue of charity and truth, a dialogue which is not only an exchange of ideals, but also of gifts, in order that the fullness of the means of salvation can be offered to one’s partners in dialogue. In this way, they are led to an ever deeper conversion to Christ. 14. The Doctrinal Note recalls that the missionary mandate belongs to the very nature of the Church [i.e., the Church cannot not evangelize. Sorry, Russian Orthodox Church!]. In this regard it cites Pope Benedict XVI: "The proclamation of and witness to the Gospel are the first service that Christians can render to every person and the entire human race, called as they are to communicate to all God’s love, which was fully manifested in Jesus Christ, the one Redeemer of the world." Its concluding sentence contains a quotation from Pope Benedict’s first Encyclical Letter "Deus caritas est": "The love which comes from God unites us to him and ‘makes us a we which transcends our divisions and makes us one, until in the end God is all in all (1 Cor 15:28)’." That's right, Joe the Baptist, not John. The following is a very true but very sad note left from a Baptist named Joe Bailey on the Zenit site this Saturday. Just read this over and think about it for a few moments; if Baptists understand this, why can't we? I am a Southern Baptist, but I frequent the ZENIT site and do so in part out of curiosity concerning ecumenism and Catholic-Baptist relations. Now what I am about to write is not done to berate Catholicism, but to state what appears to an "outsider looking in." For years now, I have been fascinated as to why lay Catholics seem unable to fulfill the mandate of say, I Peter 3:15 [Always be ready to give an explanation to anyone who asks you for a reason for your hope]. There seems to be a lack of "clear conviction" on the part of many, and an almost "defeatist and I-am-sorry-that-I-am-a-Catholic" approach to defending their faith/beliefs. This should not be so if they believe in the authority of Catholicism that is often thrown up as a defense in regards to religious/theological discussions with Protestants. I wonder if it would not behoove Catholicism to do a better job of grounding their believers in the Scripture as much as Tradition, and emboldening them in their expression and sincerity of faith? Wow! He really said it all. I have noticed the same thing when talking to Catholics in the course of my work with the Church. Catholics are consistently some of the worst evangelizers among all branches of Christianity, both because of lack of motivation and lack of the right intellectual foundation to actually carry out the work of evangelization. This Mr. Bailey suggests we ground our people more in Scripture and less in Tradition; I can certainly agree with the first proposition, but he is wrong in the second. What Catholics need is a better grounding the Scripture interpreted in light of Tradition and, by consequence, a more solid grounding in Tradition itself. The reason so many Catholics have a "defeatist and I-am-sorry-that-I-am-a-Catholic" mentality is because they are cut off from Tradition and therefore (1) Are unable to defend attacks lodged against the Church in the area of her Tradition, (2) have a lack of a clear conviction in the veracity of that Tradition because they themselves are broken off from it. Even if people don't know it or cannot express it in words, what ails modern Christianity (all pieces of it) is a lack of a sense of mystery and transcendence, rendering all our religious efforts worldly and time-bound. Mystery is brought about by adhering to Tradition, for two reasons. First, the Traditions are set up to focus us on that mystery, and second, Tradition itself has a kind of mysterious character to it. It is something that was there before us and will be there after us and has a sort of transcendence to it that comes partially from its object (worship of God) and partially from its historical longevity that reminds us by-gone days. If we have no grounding in our Tradition, then how can we hope to have a traditional "Catholic" interpretation of our own Scriptures? If we can't do that, how can we really know what our message is? And how can we spread it to others? We end with Cardinal Dulles' absurd proposition that we just sit around sharing faith experiences with each other and kind of throw the whole conversion thing out the window as old fashioned and unecumenical. God forbid! If this Baptist can see the truth so clearly, why can't we? by Father Chad Ripperger, F.S.S.P. Among the traditional faithful there appears to be a kind of intuitive sense that the old rite of Mass is more efficacious than the new rite. Many believe that they derive more spiritual gain from the old rite of Mass than from the new. However, to give a more precise expression to the intuitive sense of which is more efficacious, the new or the old rite, it is necessary to make several distinctions. Since the purpose of this article is very specific, i.e. to ascertain which ritual is more meritorious or efficacious, certain issues regarding the value or efficacy of the Mass will be avoided. After reading that introduction how could anyone not want to read the rest of the article? Unfortunately, I've not been able to locate the whole article online (other material by Fr. Ripperger is available at Sensus Traditionis). If you don't have this particular issue of the Latin Mass Magazine on hand it is easy to acquire back issues. I'm going to spoil the ending for those who haven't read this: the old rite of Mass is more efficacious than the new. As regards intrinsic merit of course any valid Mass is infinitely meritorious. But we finite creatures are unable to receive infinite grace. Therefore, the fruits of the Mass actually communicated to us are finite and they will be greater or less based on a number of factors. The holiness of the Church who offers the sacrifice affects the merit of the Mass - there is no distinction here between old and new rites, the Church is always spotless. The priest merits graces for us in offering the Mass inasmuch as he is a priest - here again there is no difference between old and new. The priest also merits as a private person - here we have fruits of the Mass ex opere operantis. The faithful can similarly increase the merit of a Mass by their holiness - this means that being present at Mass in a state of mortal sin (even if you do not receive Communion) actually decreases the grace communicated to everyone else. Of course, this doesn't mean you should not go to Mass. It means you should go to confession. Fitting decora also serve to increase the merit of a Mass, whereas unsuitable decora decreases it. To quote Fr. Ripperger: "Ugly things please God less and thus merit less." What refreshing bluntness! And finally, the merit of the ritual itself - which I must leave to another post! Please offer a prayer for me this week as I wade through exams. Deus miserere me! I was just listening to a very engaging CD series by Dr. Lawrence Feingold called "The De-Christianization of Western Civilization" in which he mentions the work of a certain Italian sociologist named Dr. Giovanni Sartori. This Italian wrote a fascinating and much controversial work entitled Homo Videns: Teledirected Society, in which Sartori makes some very pertinent warnings about the effects of too much exposure to television and the Internet on the human mind. The "It's a Beautiful Day" argument: "Why do you spend so much time in front of the TV? It's a beautiful day outside! Go ride your bike, play with your friends, get out and do something active for a change!" The "Tool of Satan" argument: "My kids don't watch TV because the programming is so immoral these days that I can't in good conscience let them watch it." Both of these arguments are valid, but weak, because they refer to things extrinsic to the television itself. In argument 1, one is encouraged to go outside and do something active. But suppose one has already done something active that day? Or suppose it's not a beautiful day, but rather it is a dreary, miserable Michigan January? In those cases, the argument seems to fall apart because it is based not on the disvalue of the television but on the existence of a better good outside of it. But if there is no better good outside at that time, it would seem that vegging out in front of the tube would be acceptable. In argument 2, a similar mode of reasoning is taken up. TV is bad because too much immoral things come through it. But suppose that there exists a lot of programming that was good and moral, then would you not object to kids watching it four hours a day? Again, the argument against television in this case refers to something besides the act of TV watching itself (i.e., the shows that happen to be coming through the TV). Now, there has been a third, vague and undefined argument against too much TV, and it is precisely this argument that Sartori takes up: the old "TV rots your brain" argument. I don't think most of us have given any thought to what this means, but we may have repeated it to our kids and had it repeated to us. Does TV "rot your brain?" If so, this would pertain to the act of TV watching itself, regardless of what was on or how the weather was outside. Sartori points out that man has always been characterized as a rational animal, a homo sapien ("thinking man"). This means that his mental life is characterized by symbolization, the uttering of meaningful sounds and words that stand for abstract ideas. Sensory input gives information to the brain which then interprets the input in the form of ideas, and thus we come to grasp reality primarily through the intellect. Now, since the advent of the television and the Internet, Sartori warns that most of our experience of the world and of abstract ideas (things like justice, love, etc.) are coming to us primarily through visual input alone. An excess of TV watching has turned men from beings who think about the world to beings who simply see it. This is what he calls the "involution" of man from homo sapiens ("thinking man") into homo videns ("seeing man"). This is even worse with the advent of the Internet: in television, man sees real images, but online he sees a lot more synthetic images that do not even reflect reality at all. When man apprehended the world through reading, discussion, contemplation, etc., the reasoning faculty of man was fully engaged and he was more easily able to make logical connections and grasp meanings beyond the bare external. But what characterizes homo videns? Here is Sartori's definition: "tires of reading, prefers the abbreviated flash of a synthetic image. It fascinates and seduces him. He renounces logical links, reasoned sequences and reflection. By contrast, he yields to the immediate, heated, emotionally involving impulse." Reading, on the other hand, requires solitude, concentration, discriminating ability, appreciation for conceptualization and reasoning. 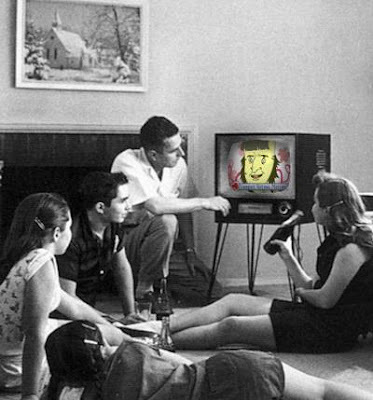 Essentially, Sartori says that TV has made the brain "softer" with the consequence of turning mankind into a being that primarily relates to the world through the visual medium only. For Sartori (an evolutionist), he puts this phenomenon in terms of actually reversing human evolution; hence the phrase "involution." We have become an age that values seeing over being. This criticism of television is more fundamental and important than the other two mentioned above, because this criticism actually concerns itself with the act of watching TV itself. I think Sartori puts into words what a lot of us suspected about TV for a long time but were unable to put into words: that it does indeed "rot your brain." I tried to find this book, but it is currently only available in Spanish and Italian. Cardinal Avery Dulles has an interesting article in the latest issue of First Things in which he discusses the ecumenical movement fifty years after the Oberlin Conference of 1957, where the Catholic Church first entered into the ecumenical dialogue with other Christian bodies. He has many pertinent and fascinating things to say about ecumenism, but ultimately I think his conclusion that he draws from his observations is way off. First, he mentions what everybody interested in ecumenism already knows: that it is scandalous that so many different Christian communities exist. While affirming the truth that the Church of Christ "subsists" in the Catholic Church, he makes sure (like a good ecumenist) to mention that there nevertheless exists means of grace and sanctity in other Christian bodies. It seems that anytime anybody says the Catholic Church is the Church, they always feel obligated to "balance" it by pointing out the fact that there exists elements of grace and truth in other denominations. But I digress. Many of the twentieth-century dialogues have opted to take Scripture, interpreted by the historical-critical method, as their primary norm. This method has worked reasonably well for mainline Protestant churches and for the Catholic Church since Vatican II. But many Christians do not rely on the critical approach to Scripture as normative. Catholics themselves, without rejecting the historical-critical method, profess many doctrines that enjoy little support from Scripture, interpreted in this manner. They draw on allegorical or spiritual exegesis, authenticated by the sense of the faithful and long-standing theological tradition. As a consequence, certain Catholic doctrines, such as papal primacy, the Immaculate Conception, the Assumption, and purgatory, have been banished to the sidelines. Unable to cope with doctrines such as these, the dialogues have treated them as an ecumenical embarrassment. It is interesting that Cardinal Dulles identifies this kind of "scripture-only" emphasis as the historical-critical method, that same nefarious method that was so soundly denounced by Pius IX and St. Pius X. But since Vatican II, Cardinal Dulles says that it has "worked reasonably well." But nevertheless, this method has led to our most cherished doctrines being "banished" as an "ecumenical embarrassment." Is that working reasonably well? Cardinal Dulles says that traditional ecumenism, until now, has revolved around a "convergence" method. This simply means finding out that we all really believe the same thing about something and the perceived differences are only matters of semantics and terminology. He cites the Catholic-Lutheran Joint Declaration on Justification as an example. By ecumenical convergence, denominations come together with the Church on every issue that they can possibly agree upon: pro-Life issues, the inerrancy of Scripture, the immorality of certain acts, etc. With this mentality, Catholics would want to hear from the churches of the Reformation the reasons they have for speaking as they do of Christ alone, Scripture alone, grace alone, and faith alone, while Catholics tend to speak of Christ and the Church, Scripture and tradition, grace and cooperation, faith and works. We would want to learn from them how to make better use of the laity as sharers in the priesthood of the whole People of God. We would want to hear from evangelicals about their experience of conversion and from Pentecostals about perceiving the free action of the Holy Spirit in their lives. The Orthodox would have much to tell about liturgical piety, holy tradition, sacred images, and synodical styles of polity. Vatican II, therefore, represents a sharp turn away from the purely negative evaluation of non-Catholic Christianity that was characteristic of the previous three centuries...Regarding the ecclesial status of non-Catholic Christians, Pius XII had taught as late as 1943 that they could not be true members of the Church because the Body of Christ was identical with the Catholic Church [what does he mean by saying "as late as 1943?" This seems to imply that this teaching is no longer true]. Such Christians could not belong to the body except by virtue of some implicit desire, which would give them a relation that fell short of true incorporation. 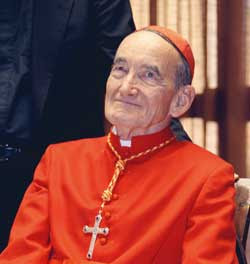 From a different point of view, Vatican II taught that every valid baptism incorporates the recipient into the crucified and glorified Christ, and that all baptized Christians were to some extent in communion with the Catholic Church...Relying on the new ecclesiology of communion, Catholic ecumenists now perceived their task as a movement from lesser to greater degrees of communion. All who believed in Christ and were baptized in his name already possessed a certain imperfect communion, which could be recognized, celebrated, and deepened. So, while the three previous centuries, in which the Church had a "purely negative evaluation" of Protestantism, we are now going to suddenly adopt a "new ecclesiology of communion" in which the divisions in Christianity that the Cardinal just finished saying were scandalous are to be "celebrated." So, what used to be viewed as a definite negative (division in Christendom) as now going to be celebrated as a positive good and a source of mutual enrichment (*barf*). The process of growth through mutual attestation will probably never reach its final consummation within historical time, but it can bring palpable results. It can lead the churches to emerge progressively from their present isolation into something more like a harmonious chorus. Enriched by the gifts of others, they can hope to raise their voices together in a single hymn to the glory of the triune God. The result to be sought is unity in diversity. It's a beautiful image, but unfortunately it is not the scriptural one. Our unity is not to be a unity found in diversity (what kind of double-talk is that anyway? ), but a unity based on the unity of the Father with the Son, in which we are "neither confounding the Persons, nor dividing the substance." The saddest thing about this is that the Cardinal proposes this new method precisely because he sees the shortcomings of the standard "convergence" method. But he proposes his "growth through mutual attestation" because he fears a return to polemical (i.e., dogmatically based) ecumenical debate that characterized Protestant/Catholic relations in the post-Tridentine period. For him, it is good enough that we come to accept and understand each other, making a "harmonious chorus." 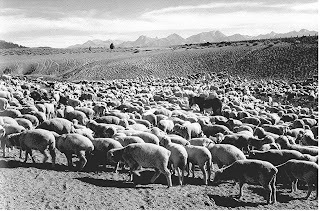 This is a far cry from the one sheepfold spoken of by Christ. Whoever wishes to be saved must, above all, keep the catholic faith. For unless a person keeps this faith whole and entire, he will undoubtedly be lost forever...This is the catholic faith. Everyone must believe it, firmly and steadfastly; otherwise He cannot be saved. Amen. The following proposition is condemned in # 17 of the Syllabus of Errors: "Good hope at least is to be entertained of the eternal salvation of all those who are not at all in the true Church of Christ." Click here for the complete text of Cardinal Dulles' article. How much land does the Church own? "I always wanted to be a June bride."